DENALI NATIONAL PARK, Alaska — Time and the forces of nature will decide if Mount McKinley is immortal, but it’s so mighty that it seemingly decides when to display its 20,320-foot-tall majesty. The mountain is also called by its American Indian name, Denali, meaning the Great One or the High One. 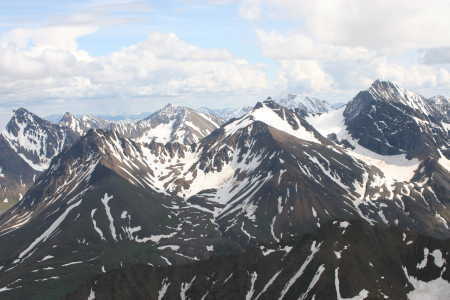 Indeed, it is the highest point in North America and, because of its immense bulk, on a clear day it can be seen in Anchorage, about 150 air miles away. But that isn’t often: McKinley creates its own mini-climate and usually is wreathed in clouds. Thus, at least two-thirds of the people who travel to the vast Denali National Park and Preserve — larger than Massachusetts — never get to see even the top half of the namesake mountain. So when it does show itself — when the mountain is “out” as they say here — it inspires joy, and awe, in viewers. Yet the same can be said for the much-easier sighting of wildlife that roams the park, including parking lots and roads. How many of us in the Lower 48 get within 20 feet of a female grizzly bear as it munches on berries? Or watch a moose cow with its youngster, grazing on a hillside, or see a caribou sitting in a patch of snow to get relief from insects? I could have checked off all of these critters, and more, on my seen-that list during the free, narrated Tundra Wilderness Tour on my recent visit. But I also brought home pictures, and the memories. Driver-guide Jeff Farragia took his busload of 47 on a graded but unpaved road 63 miles into the park, to Stony Hill Overlook. We were 33 miles from Denali, and clouds covered perhaps the top fifth, but it was still a spectacular sight. I got the up-close-and-personal view, though, by plunking down $350 for a flightseeing tour. I made the one-hour flight in an eight-seat, twin-engine Piper Navajo. Pilot Dan McGregor took us within 2,000 feet of the Wickersham Wall, a 50-degree slab of snow-covered granite, at 12,000 feet up on Denali. It was dazzling. I added to my mental scrapbook with a two-hour raft ride down the 11-mile Canyon Run of the Nenana (nee-NAH-nah) River. 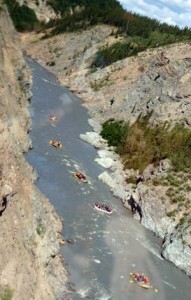 Class III rapids bounced us around as we sat bundled head to booties in rubber suits and life jackets. You can also get a taste of the park by hiking or biking over dozens of miles of trails in the untouristed backcountry, by jouncing along on a Jeep safari, and by camping, visiting with the park’s sled dogs — used for ranger patrols in the winter — taking other narrated bus tours, strolling ranger-led nature walks, or just sitting in on films and live presentations at the Visitors Center. Many of the paths and the rides are wheelchair accessible. Open year-round, Denali offers thrills and inspires awe, but most of all, it creates memories, mountains of them. 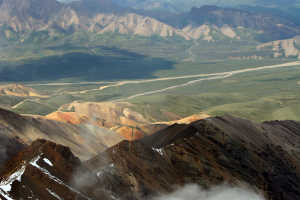 Denali National Park and Preserve main entrance is 237 miles north of Anchorage, Alaska’s largest city. Entrance fee is $10 for individuals, or $20 per vehicle, for up to seven days’ visit. To learn more, call (907) 683-2294, or go to . There are hotel rooms available just outside the park boundaries; call (907) 683-4636. I flew to Mount McKinley on Denali Air, www.denaliair.com; (907) 683-2261. I rafted with Explore Denali, which has several options, from challenging to less so; toll-free 1-800-276-7234.